5 Secrets to Having a Successful School Year! Can you believe it is already July? It seems like just yesterday school was ending. Many of you are secretly wishing for time to slow down as your break seems to be dwindling before your eyes. July is a month where teachers begin to slowly get their minds back into teacher mode and start thinking more in depth about the upcoming year. This is also around the time teacher begin to dust off curriculum maps and consider possibilities for units and lesson. This is a way of preparing the content and instruction for a new year. The end of the month is when many teachers get access to their classrooms and begin furniture arrangements and decor decisions! Classroom themes start to come alive and the four walls of ordinary rooms become inviting spaces for learning and life changing experiences. This is a teachers way of preparing the physical space. Teachers also start to consider things they will do for their new students and parents, like welcome ideas, classroom expectations, routines/procedures, birthday recognitions, community building activities, parent communication and engagement strategies. This is preparing for the children and parents. Each of these preparatory steps are necessary however; there is one step that many teachers omit, that I want to spend some time on….and that is preparing YOURSELF to persevere and have a successful school year! I would even go as far as saying that this one of the most important types of preparation and one of the most neglected. Everything that makes for a successful classroom and school year rests on the knowledge, creativity, preparation, strength and perseverance of teachers. Teachers who have taught at least a year, will agree that it takes A LOT to do it well. 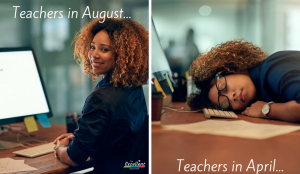 As the year progresses, your energy and patience will decline, leading to teacher burnout. Disclaimer: If you are a first year teacher this will all make sense around November and definitely in March. My question to you reading this article is – Are you personally prepared to persevere and have a successful school year? Luckily there are many ways to prepare yourself to get through unforeseen frustrations, burnout and other educator problems that may creep up on you this year. The simple three letter word, (why?) when formed as a question, is one of the most powerful questions that exist. I have always liked the question “why?” because I’m naturally inquisitive. Even as a child I remember constantly asking “why” of everything that happened. As an adult, I am still intrigued by that question, only now the shift is to more self reflection and asking “why” of myself and things that I do. Pausing to ask yourself why certain things happened creates huge self realization. Have you ever stopped to ask yourself, “Why am I doing this?” or “Why am I feeling this way?” This concept of “why” is especially powerful as it relates to your job, your career and how you choose to spend your time. One of my favorite leadership reads is Start With Your Why, by Simon Sinek. He suggests that the most inspiring leaders start with their WHY which then informs their HOW and their WHAT. This concept is true for educators as well. It’s actually super critical in persevering and having a successful school year. Your “why” will incorporate your purpose, your cause and your belief. I challenge you to ask yourself a few question that will help you to pinpoint – or remind you of your why. 1. Why am I teaching, an administrator, a media specialist, a school counselor? 2. Why is this important to me? 3. What is the impact of what I do and who will be impacted? 4. What are my beliefs around what I do? 5. What is the mark I will leave on those around me? 6. How will I commit to do what I need to do this year? The answers to these questions are a huge factor for your personal drive to persevere. They are in essence, your why. Discovering answers to these also provides you with a personal declaration of commitment for yourself. Be sure to write it down. It will become useful throughout the year. Discovering and writing your why is only one part to it benefitting you. You must focus on your why and revisit it. I’ve learned that what you focus on will can either hinder or help you persevere and be successful. On tough days when you are discouraged or frustrated, focusing on your why, will give you the push you need! Read your why on Mondays, when you sometimes lack Motivation (I’ve seen your “Oh, boy it’s Monday” posts 👀) or try reading it daily when you pull up in the parking lot, as a way to start the day and mentally prepare yourself. Your perspective makes all the difference, so fix your focus daily… you’ll thank yourself. Stress is inevitable for educators and every other profession. Although the day to day tasks vary with the work you do, it’s impossible to steer clear of all stress. If you know you can’t avoid it, then it means you’ve got to be prepared to tackle it. How you handle stress can have a large impact on your drive and even your overall health and wellbeing. Luckily you do have the power to manage stress. I’ll help you to be proactive and plan for it. Find a stress reliever daily or at minimum weekly. I know you’re thinking, “I don’t have time for that!” It doesn’t have to be a long task. Discover small things that help you relieve stress. Yes, daily massages at Spa Sydell sound amazing to relieve stress, but if you’re in the same boat with me and that’s not in the budget, you’ll have to find more feasible options! 1. I read something up lifting. Most of my daily stress relievers can be done in 10 minutes or less. Embedding these things into my days makes a difference. Small daily stress relievers are good but every now and then you should still indulge in other stress relievers that span longer than 10 minutes. (Shopping, Fishing, Watching Movies or TV Shows, Working Out, Coloring) Pick things that fit you. Remember, a stress reliever is anything that can take your mind off stressful situations and/or daily life challenges. I think of them as mental vacations. Figure out some things that take your mind away from all it has to think about and do! It’s tough for an exhausted and overwhelmed person to be successful. I know you may feel like Superman/Superwoman some days and want to spend every waking hour getting things done, but exhaustion is a major killer of your drive. When your drive is compromised it impacts your ability to be successful. Don’t you seem to be most productive and do your best when you’re rested? Why is it that we push ourselves so far without adequate rest? I want you to learn the art of rest or what I call unplugging. It wasn’t until recently I learned to do this myself but believe me when I say, it makes a difference. When you unplug, it means you push the pause button to power down to rest. It can also serve as another type of stress reliever. I find it so valuable that it has become another weekly scheduled task. I’ve learned that rest is a necessity to do your best! I don’t know all of you personally, but I am willing to bet if I looked at your “why” for being in education, it will include you feeling like it is calling and somehow part of you purpose. (After all if you’re taking time to read “Secrets to a Successful School Year” you’re not in your role to collect a check.) When you feel like you’ve been called to do something, it comes from a source outside of yourself. A calling is a strong urge towards something or a way of life. When you operate in your calling there are times when you don’t feel like doing or being what you’re called to be but that inner pull will always push you to continue. If this sounds like you, then prayer will prove to be the the most important secret to success. If your calling comes from a higher power, then why would you try to fulfill it by yourself? The best educators never forget to consult with the One who called them to the work! Don’t try to do it alone. Pray daily for strength do the the work. Pray for patience. Pray for wisdom and creativity. Pray for your students, your parents, your administrators, other teachers and everyone who plays a part in your labor of love. Pray that you will answer the call that your heard with excellence and complete a successful school year with great purpose! 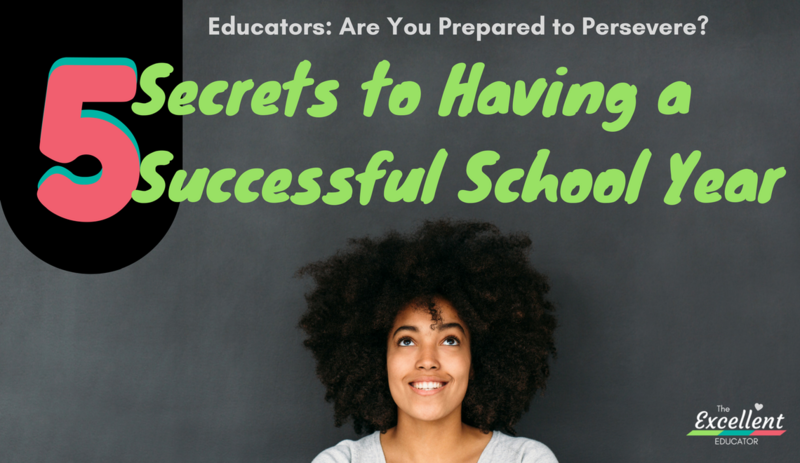 Now that you have some secrets to having for a successful school year, don’t keep it a secret! Please share this with teachers, administrators and anyone you may know who is in education. We have important work to do so let’s support each other along the way. If you have any additional secrets to success to share with other readers and myself, please do so below! Love it! Yes prayer is the key!!!! Yes it is Brenda! Thanks for your input and taking time to read the article!!! Love this!! A great intro to a successful school year. I really needed to read this. I would love to share this! Great information! So glad you took time to read the post and enjoyed it! Please do share it with others! Feel free to email the link and share it on social media. We have to support one another as educators! 😊 I also hope you will subscribe and stay connected. Have a wonderful school year!